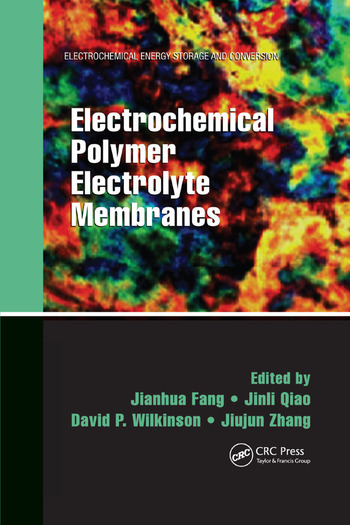 Electrochemical Polymer Electrolyte Membranes provides a systematic overview of the state of the art of PEM development, making the book a beneficial resource for researchers, students, industrial professionals, and manufacturers. Jianhua Fang is an associate professor at the School of Chemistry and Chemical Engineering, Shanghai Jiao Tong University (SJTU), China. Dr. Fang holds a B.Sc from Hunan University, M.Sc from SJTU, and Ph.D from Yamaguchi University, Japan. He carried out two terms of postdoctoral research at Yamaguchi University and Case Western Reserve University, USA. Dr. Fang has more than 20 years of R&D experience in high-performance polymeric materials. He has coauthored approximately 100 publications, holds more than 20 Chinese patents and 5 Japanese patent publications, and serves as an editorial board member for the journal, Scientific Reports. Jinli Qiao is a professor, Ph.D supervisor, and core competency leader of the College of Environmental Science and Engineering, Donghua University, China. She is also the vice chairman and vice president of the International Academy of Electrochemical Energy Science. Previously, she worked as a research scientist and principal investigator at the National Institute of Advanced Industrial Science and Technology, Japan. As the first and corresponding author, Dr. Qiao has published more than 100 research papers in peer-reviewed journals, 40 conference and keynote/invited oral presentations, 4 coauthored books/book chapters, and 20 patent publications. She holds a Ph.D from Yamaguchi University, Japan. David P. Wilkinson is a professor and Canada Research Chair (Tier 1) at the Department of Chemical and Biological Engineering, University of British Columbia (UBC). He holds a B.ASc from UBC and Ph.D from the University of Ottawa, Canada. Widely published, with more than 75 patents and numerous awards, Dr. Wilkinson has more than 20 years of industrial experience in fuel cells and advanced lithium batteries. He has served as a principal research officer and senior advisor with the National Research Council Institute for Fuel Cell Innovation, director of UBC’s Clean Energy Research Center, director and vice president of research at Ballard Power Systems Inc., and group leader for chemistry and electrochemistry at Moli Energy. Jiujun Zhang is a principal research officer at the National Research Council of Canada, fellow of the International Society of Electrochemistry, and chairman and president of the International Academy of Electrochemical Energy Science (IAOEES). His areas of expertise are electrochemistry, photoelectrochemistry, spectroelectrochemistry, electrocatalysis, fuel cells, batteries, and supercapacitors. He holds a B.Sc and M.Sc from Peking University (PKU), and Ph.D from Wuhan University. He carried out three terms of postdoctoral research at the California Institute of Technology, York University, and University of British Columbia (UBC). Widely published, Dr. Zhang holds more than 10 adjunct professorships at institutions including the University of Waterloo, UBC, and PKU. "This book is clearly up to date and represents a considerable amount of work by the authors, who all appear well qualified to write their respective chapters. The subject area of each chapter would merit an entire book in that field alone, but … the value here is in linking the subject areas together so that the reader can benefit from having them all in one book. … The editor has done a good job of pulling together so many topics and presenting them as a coherent whole. I would definitely recommend this book for readers who are either experienced or new in this exciting field." "… gives a comprehensive description of the science and technology of various types of polymer electrolyte membranes (PEMs) and their application in electrochemical technologies. The PEM material selection, synthesis, and characterization as well as the fundamental understanding of membrane processes and their associated performance are emphasized. The authors of all chapters in this book have both strong academic and industrial expertise, and provide fundamentals as well as up-to-date technical knowledge and information, challenges, and future directions, making the book attractive to … researchers, engineers, and professors/students who are working in the area of electrochemistry-related PEMs."